Olga Taran, 101, of Powhatan, formerly of Melbourne, Fla., widow of Mykola Taran passed away and went to be with the Lord April 7, 2019. She was a loving mother and grandmother who always put everyone's needs and wants ahead of hers. She loved vegetable gardening and cooking, up till her 90's. She is survived by son, Nick Taran; daughter, Helen Sapp; grandson, Michael Sapp all of Powhatan. Olga entered the United States from Ukraine through Ellis Island in 1950 with her husband and young son. 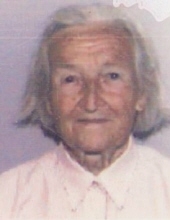 A graveside service will be held Monday, April 15, 2019 at 1:30 pm in the St. Vladmir's Russian Orthodox Christian Cemetery, Jackson, N.J.
To send flowers or a remembrance gift to the family of Olga Trifanov Taran, please visit our Tribute Store. "Email Address" would like to share the life celebration of Olga Trifanov Taran. Click on the "link" to go to share a favorite memory or leave a condolence message for the family.